Roast in oven covered for 3-4 hours (ready when pork can be separated easily with 2 forks). Uncover and drain liquid into saucepan then cook for further 20 minutes at 200 degrees. Reduce drained liquid in saucepan with ½ cup brown sugar. Cook on low heat for 30-45 min stirring regularly. Shred pork and mix in reduced liquid. (Alternatively you can discard liquid and mix in our Berenberg Smokey Sauce, which works great). 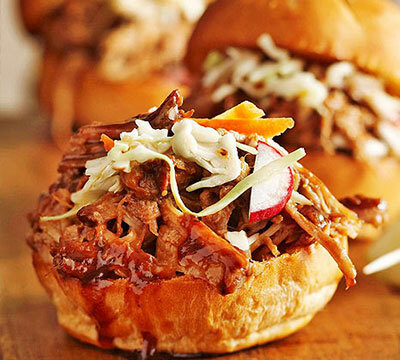 Serve as sliders with homemade slaw.